The new pension scheme arrangements from April 2015 have resulted in a big increase in information about our pensions schemes in Scotland. We have therefore established a dedicated site - Pensions Scotland at www.pensionsscotland.org where all future UNISON Scotland pensions info will be posted. The Scottish Local Government Pensions Scheme Advisory Board (SLGPSAB) is responsible for advising Scottish Ministers on the desirability of changes to the design of the scheme and the implication of other policy issues. Also the Board is responsible for the provision of advice to the Scheme managers or the Scheme’s pension boards in relation to the effective and efficient administration and management of the scheme. The minutes of meetings will be published on the SPPA website http://www.sppa.gov.uk/ and there will be a short bulletin like this after each meeting. 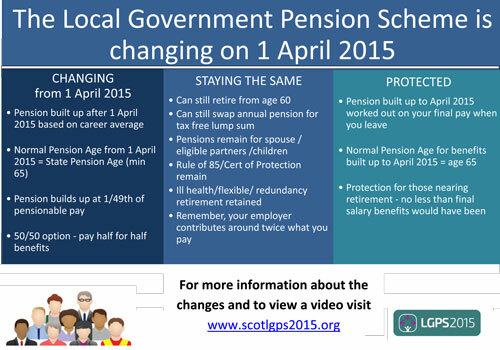 New Scottish Local Government Pension Scheme started on 1 April 2015. Pensions ‘Choice’: From 6 April new rules came into effect that give increased flexibility in the options available to members over 55 years of age when taking their pension benefits in Direct Contribution schemes (DC). Public sector and the better private sector schemes are Direct Benefit (DB) schemes and are not directly covered by these changes. LGPS Governance: The Scottish Local Government Pension Scheme has a new Scheme Advisory Board (SAB) that will hold its inaugural meeting on 30 April. This Board replaces SLOGPAG and is responsible for advising Scottish Ministers on the scheme. The new NHS Pension Scheme 2015 comes into effect from 1 April 2015. The SPPA's NHS 2015 website has full information about the new NHS pension scheme. The SPPA NHS 2015 website also includes a short video which can be used at members’ meetings. The SPPA pensions 2015 site also covers other new schemes including local government, fire and police. Members will have started to receive letters from SPPA advising of the changes. There are three letters in all, one for members with full protection; one for members with tapered protection and one for staff moving to the new scheme on 1 April 2015. Please note: There will be a Choice Exercise on the new NHS Pension Scheme 2015 commencing in the summer. New Scottish Local Government Pension Scheme starts on 1 April 2015.
least one UNISON representative (and one substitute) on every pension board in Scotland. A two day training course for UNISON pension board members and substitutes takes place on 5th-6th March 2015 at UNISON House in Glasgow. If you want to attend please advise Fiona Martin (f.martin@unison.co.uk) by 16 February 2015. Initial agreement has been reached on a new approach to the governance of local authority pension funds in Scotland. An approach that puts the governance of the scheme and funds on a statutory basis and gives scheme members a real say in how their pensions are managed. "UNISON Scotland does not agree to the draft regulations. They are a tax on hard pressed NHS workers who in many cases cannot afford to contribute more to their pension and are being penalised through the reckless risk taking of the banking and financial sector. Ultimately these proposals risk mass opt-outs which will only serve to increase dependency on the State. "We do not accept that the Scottish Government has no option other than to follow the UK Government’s proposals. There is a separate scheme in Scotland and there are other options to fund the cost. These should be pursued in partnership through the Scottish Terms and Conditions Committee and the Scottish Pensions Group." The ballot for the Scottish LGPS 2015 closed today. The result was 94% accept and 6% reject. Many thanks to everyone, staff and activists who worked on this ballot. SIX DAYS TO COMPLETE AND RETURN YOUR BALLOT! November 2013. Please encourage any member who hasn’t voted to do so immediately. In this bulletin we deal with some of the most frequently asked questions. eg: What is a ‘CARE’ scheme? LGPS Ballot opens 16 october; Recruit a friend (see leaflet below). Update on Scottish Local Government Pension Scheme (SLOGPAG) talks: Core benefit of new scheme - accrual rate; other benefits; member contributions; scheme governance; next steps. Progress in second stage of Scottish Local Government Pension Scheme (SLOGPAG) talks. The main change is that the new scheme must be a defined benefit ‘career average’ (CARE) scheme as final salary schemes will be unlawful. Contact your MP and MSPs direct by email now - click here - to lobby for amendments to the Bill which will will leave Scottish public service pension schemes free to design a scheme that meets Scottish requirements. 31 March: Scottish ministers agreed to talks starting on 28 March over medium and long-term changes to the NHS Pension Scheme. But they have made it clear that they are not prepared to negotiate over the first year contribution increases, and regulations to implement them has been tabled in the Scottish Parliament. UNISON Scotland urges MSPs to reject regulations laid before Scottish Parliament which impose increased contributions on health workers, and calls on the Scottish Government to enter into meaningful negotiations to stop the pensions tax. 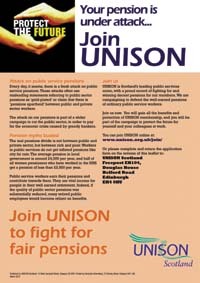 UNISON Scotland will on Tuesday 13 March kick off a new round of industrial action on NHS pensions. A number of selective strikes are planned to increase pressure on the government for a Scottish solution to all aspects of pensions changes. This includes the year 1 increases to employee contributions of up to 2.4% - which are effectively a pensions tax on health workers. UNISON health members in the Central De-Contamination Unit at Ayrshire Central Hospital Irvine will be taking industrial action on the issue of pensions on Tuesday 13 and Wednesday 14 March 2012. A picket line will be in force each day from 9am until 12 noon. 2 March 2012: UNISON protesters lobby Health Minister as Scotland launches further industrial action on pensions: UNISON Scotland will on Monday 5 March launch a further round of industrial action on changed proposed to NHS pensions. UNISON activists have voted to give the union’s negotiators the green light to continue discussions with government ministers on changes to public sector pensions. UNISON Scottish Convener Lillian Macer said: "As the Scottish Government has the responsibility to address these issues in Scotland we call upon Scottish Ministers to explore a distinct Scottish solution for the public service workforce." November 30: You were magnificent! 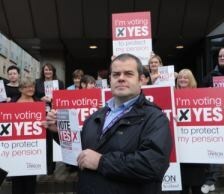 UNISON members voted overwhelmingly in favour of strike action to protect their pensions. 3 November 2011: A joint meeting of six service group executives on the outcome of UNISON's public sector pension ballots today in London. Strike action on 30 November was unanimously endorsed. 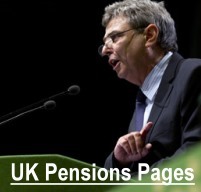 Dave Prentis, General Secretary of UNISON said: "The decisive yes vote in the ballot, reflects the deep concern that our members have over Government ministers proposals for their pensions. "Yesterday's statement in Parliament was a marked improvement on earlier proposals. "But, it is important to understand that the statement has to be translated into offers in the scheme specific talks. We still have had no offer in those negotiations, where such an offer can legitimately be made. "We support the TUC day of action on 30 November, but will be negotiating right up to then and beyond to get a fair deal for our members." Senior lay officials of the union are meeting throughout the afternoon to discuss the latest Government statement on pensions and to decide what action to take as a result of the strike ballot. Vote YES to protect your pension. Look out for your ballot paper asking you to vote for industrial action to protect your pension - your retirement is at stake. We are asking you to vote YES because proposed changes to your pension scheme simply aren’t fair. UNISON has today lodged a dispute with Scottish Ministers, CoSLA and the Secretary of State for Work & Pensions over changes to the Local Government Pensions Scheme (Scotland). The UK government strategy is clear.They want us to PAY MORE, WORK LONGER AND GET LESS when we retire. However, pension regulation is devolved to the Scottish Parliament - so MSPs have a choice to make. UNISON is calling on the Scottish Government to reject the UK plans and protect quality pensions in Scotland. Our pensions are affordable. Get the facts. 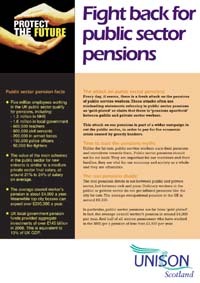 Download our new pensions leaflet. year from the Retail Price Index (RPI) to the Consumer Price Index (CPI). The effect of the change is likely to cut pension benefits by at least 15%.